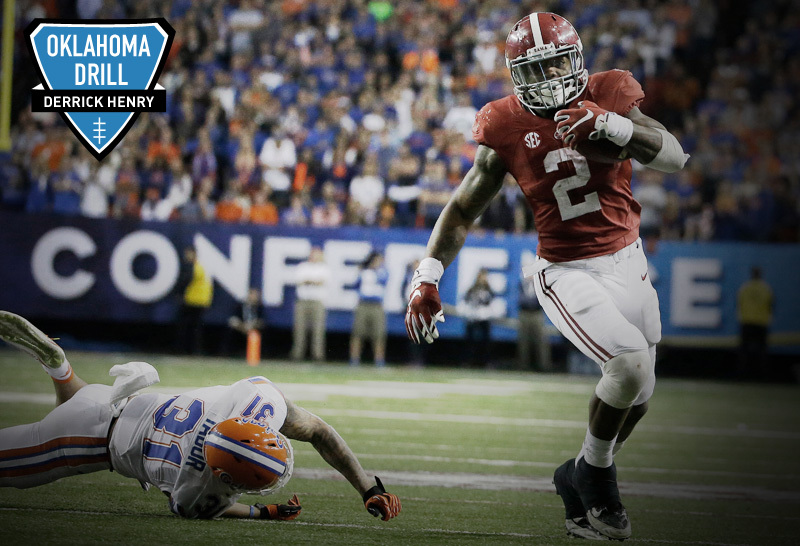 Derrick Henry had a junior season to remember with Alabama, winning the Heisman Trophy in December and leading the Crimson Tide to a national championship in January. The 6-foot-3, 247-pound running back enters the 2016 NFL Draft after a monstrous 2015 campaign: 2,219 rushing yards and 28 TDs. Henry discusses winning college football's most prestigious award, his diet and NFL goals. Just wanna come in and learn and spend countless hours on what I need to know about the offense and just everything. Just so I'm prepared and ready to play. Just go out there and work hard and help my team and let everything else fall in place. I don't really try to worry about individual goals with numbers, but I wanna help my team win games, playoffs, Super Bowls. Luke Kuechly [is the player I want to face the most]. He's just a great player, very smart and makes a lot of plays. He ain't scared to be physical. If you ain't working hard, [Nick Saban] is gonna tell you. He's real good at picking up your body language. If your body language is poor, he'll tell you right away. 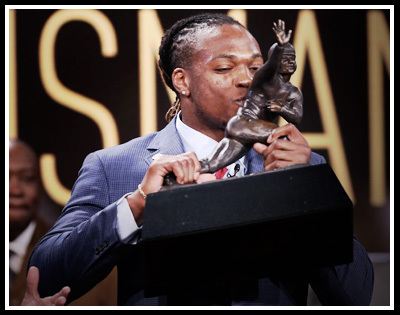 Running back Derrick Henry is the second Alabama player to win the Heisman Memorial Trophy. (Kelly Kline/Heisman Trust via AP, Pool). I think you can't worry about [the pressures of entering the NFL as the Heisman Trophy winner]. You control your own destiny. You go out there and work hard and show people that you come to work and earn your respect. All you can control is how you go out there and perform every day. When my name was called [as the Heisman Trophy winner], just a dream come true. I wanted to cry, but I was so nervous I couldn't. Just something I always dreamed of as a kid and something I'll cherish the rest of my life. I wanna be the greatest to ever play my position. One of the best to ever play the game. Hopefully, be a Hall of Famer. LaDainian Tomlinson. I loved watching him when I was little. Any team he was on, I was a fan of. I didn't really have a favorite NFL team. I just loved watching him. I had a bobblehead of him when I was a kid. In college, I loved Darren McFadden. Just the way he ran the ball. Those are my two. My eyes get big [when a hole opens up] and I'm ready to hit it. To get north and south, thinking touchdown. I can't keep no weight on. I try to eat as much as I can to maintain the weight. [I usually eat] grilled chicken, broccoli, steak, mashed potatoes, just stuff like that. 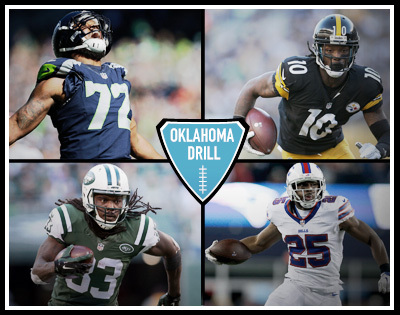 Exclusive, quick-hitting one-on-one interviews with players and coaches from around the league. Hmm? 20 or 21 [tattoos]. Yeah. I got two [favorites]. I got my grandma's name on my chest with wings and a halo. And my granddad's picture on my shoulder. Them two are most important to me. I got my mom, my sister, it's just all them mean a lot to me. [My motivation comes from] my family. They done everything to get me to this point, supported me and go out of their way to make sure I had everything. I wanna make them proud. We played Ole Miss this year and I was running the ball. Me and this boy collided, and my face mask like came off. I had to come out of the game 'cause my whole face mask came off. I was like, What in the world? It was crazy. Love L.T., Eric Dickerson, Earl Campbell. I love Walter Payton. Adrian Peterson. ... I met Adrian Peterson, but I didn't really talk to him. I love Kobe. He's a winner, just humble. He's got that killer instinct. I love to watch him play. The game can take you to a lot of places. Huge opportunity to meet great men, great people and have a brotherhood with guys. Just a special game that I love and have a lot of passion for. I really wanted to make a difference, so when [the 2014 season] ended, I just went to work and worked hard until the season came around. Just wanted to make an impact and took that role as a leader of the team, wanted to make plays and wanted the ball in my hand. Just help us win games. 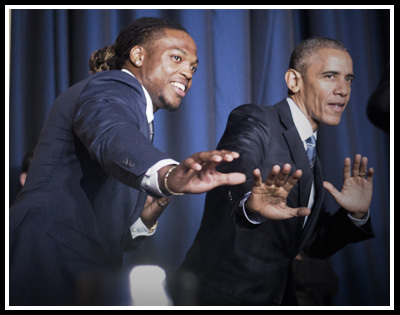 Henry flashed the Heisman pose with President Barack Obama during the Alabama football team's visit to the White House after winning the national championship. (Pablo Martinez Monsivais/Associated Press). The toughest part about being a running back is ... Oh, running backs really struggle in pass protection so you gotta be able to pick up on blitz and protect the quarterback. If you can't do that, you're not gonna play. That right there is something I'll cherish the rest of my life, meeting the president. Obama is a very cool dude and he did the pose with me, so that's something I'll always remember, as well. Coach Cochran probably [yells more than Nick Saban]. He does a lot more with the weight room, so he has to yell. Coach Cochran is always energetic. Archibald & Woodrows BBQ. No question. Humble. I feel like you gotta stay humble and keep working hard, never get complacent or satisfied.